It’s time for a new banner above Stone Ridge High School -- “Good luck Olympic swimmer Katie Ledecky ’15! A Stone Ridge girl” is a bit outdated. Something along the lines of “Congratulations gold medalist Katie Ledecky” might be a bit more appropriate. 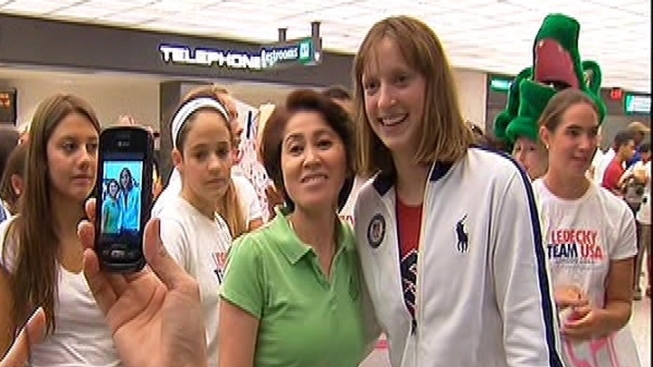 Ledecky was greeted (and mobbed), by friends, family, lots of fans (including one dressed as an alligator) and cameras Monday night at Dulles Airport at the end of her 3,000 mile trip back from London. What do you do when your 15-year-old daughter returns home from the Olympics with a gold medal around her neck? If you’re the Ledecky family you go home and have a nice, quiet steak dinner. Ledecky will be live in-studio Tuesday night on News 4 at 6 p.m. 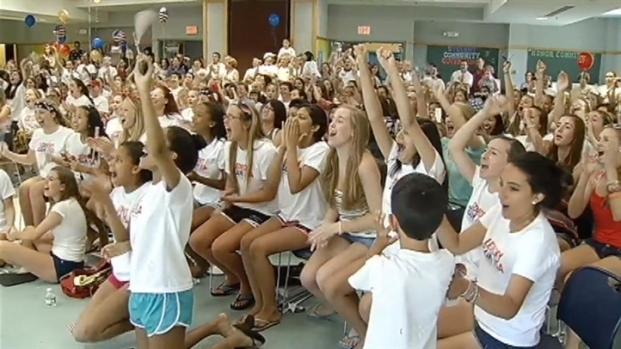 It was a party in Bethesda as 15-year-old Katie Ledecky went for gold in London.